New Vietnam War Exhibit Now Open Aboard The Battleship New Jersey ~ The History Girl! The USS New Jersey’s third commissioning service in 1968 and 1969 during the Vietnam War is distinct because she was the only active battleship in the world at that time. 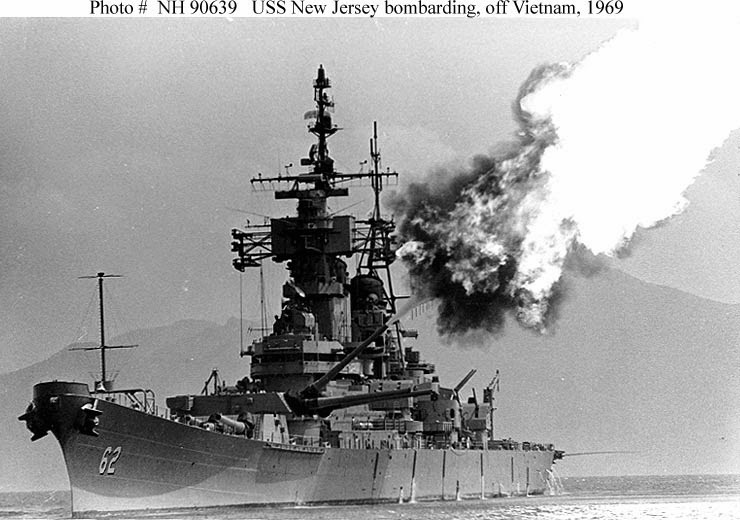 A new exhibit, titled "A Dreadnaught in Vietnam," highlights the exploits of the USS New Jersey during her Vietnam service. Come explore the battleship’s historic role in Vietnam, including several objects from the personal collection of Admiral J. Edward Snyder, Jr., the battleship’s commanding officer during her Vietnam deployment. Many of these objects have never been on public display. An example of the one-of-a-kind objects part of the Admiral J. Edward Snyder, Jr. collection on exhibit is the original commissioning pennant from the April 6, 1968 Re-Commissioning Ceremony. Other New Jersey veterans have also loaned items for the exhibit including Bert Trottier who was the battleship’s bugler during Vietnam. In fact, Trottier was the last bugler in the U.S. Navy, and his jacket is part of this exhibit. Trottier personalized this jacket with memories of his Navy career, including time spent with the Battleship and places the Southeast Asia cruise had taken him. Many of the items on display are documents, booklets, and pamphlets that contain far more information inside them, but are behind glass out of the reach of guests. To enable guests to further explore these items, the exhibit includes two “flipbooks” containing reproductions of these documents in order to get a closer look at objects in the exhibit cases as well as additional material and images not on display. The new Vietnam exhibit can be experienced as part of the Fire Power tour of the Battleship, available Saturdays and Sundays in November and December, as well as November 28 and the week of December 26 - 31. The Battleship is open for walk-up tours during the above schedule from 9:30 am with the last tour of the day departing at 3:00 pm. Located on the Delaware River, along the Camden Waterfront across from the city of Philadelphia, the Battleship is open for walk-up tours every Saturday and Sunday in November and December, as well as some select weekdays from 9:30 am - 3:00 pm. Come greet active military and homeless veterans as the Battleship will offer over 250 of these heroes on Thanksgiving Day at 10:00 am. For more information, call 866-877-6262 or visit the Battleship online at www.battleshipnewjersey.org.